Fiction – hardcover; Bloomsbury; 256 pages; 2018. 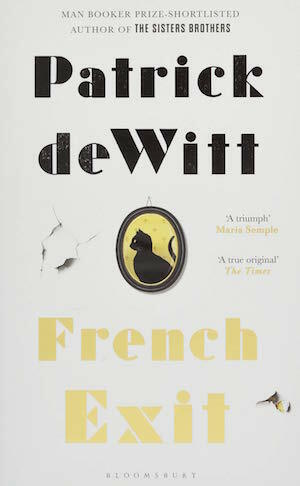 Delightfully kooky is a good way to describe Patrick deWitt’s latest novel, French Exit, which has been shortlisted for this year’s Giller Prize. I have previously read deWitt’s The Sisters Brothers, which was shortlisted for the Giller in 2011, and Undermajordomo Minor, which was longlisted in 2015. It’s fair to say that he has a penchant for the unusual and the peculiar when it comes to characters and settings, and this new one is no exception. It’s essentially a comedy of errors — think a North American Jeeves and Wooster, except Wooster is a rich morally challenged matriarch fallen on bad times and Jeeves is her loyal but hopeless son. The laugh-out-loud plot goes something like this: Frances Price, a wealthy 65-year-old widow from Manhattan’s Upper East Side, has run out of money and is liquidating her estate by selling everything she possibly can to raise some cash to live on. She moves into the Four Seasons Hotel, taking her two constant companions — her 32-year-old son Malcolm and her cat, Small Frank, whom she believes houses the spirit of her late husband — with her. To avoid scandal they decamp to Paris, France, where the trio plan to start afresh, but from the moment they set foot on the cruise ship that takes them there a series of minor disasters befall them. Once in their new Parisian home they attract a weird menagerie of acquaintances and hangers on, including a persistent house guest they cannot shake off, but they fail to make any true friends and end up falling out amongst themselves. Small Frank even runs away. Loosely based around a series of set pieces, the book has a playful energy to it. And while nothing much really happens, it has a page turning quality because the reader wants to find out what outrageous thing Frances will do — or say — next and whether the trio will ever recover their financial standing. It’s quite a voyeurestic read. Frances is a brilliant creation: a badly behaved woman who is an expert at droll putdowns, an eccentric sociopath who takes no responsibility for her poor decision making and feels hard done by without reason. I loved spending time in her company. 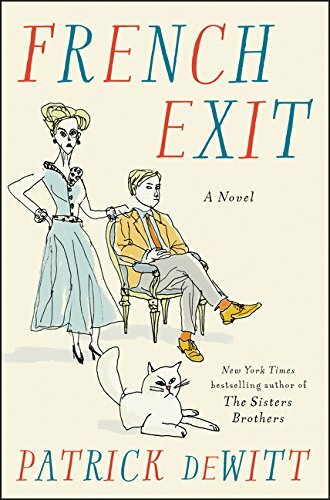 While I don’t think French Exit will win the Giller, it’s a fun, madcap read, quite unlike anything I’ve experienced before. While it’s a wonderful farce, it’s not without emotional depth — there’s a lot going on here about mothers and sons, fame for all the wrong reasons and maintaining dignity against the odds. This is my 3rd book for 2018 Shadow Giller Prize. For another take on this novel, please see Marcie’s review at Buried in Print. I was wondering how long it would be before someone set a book on one of those cruise ships. Do you ever see them in London? Here, we often do because they dock at Station Pier, and some of them are *huge*… with obvious possibilities for a contemporary version of ‘the hotel novel’. Well, only a small bit is set on the cruise ship but it is very funny. Never see those monstrosities in London (I suspect they’re too big to get through the Thames Flood Barrier) but I remember seeing them in Venice and thinking how horrendously HUGE and ugly they were. I will link your review here once you’ve written it, Naomi. Hmmm, I abandoned this when they arrived in Paris. I think I have a different sense of humour to most people. Great review, Kim. Small Frank was a triumph! Small Frank means I can’t quite look at my neighbour’s cats in the same way again… I keep expecting them to talk! It’s properly eccentric… or at least the characters within its pages are. Yes, it’s quite the page turner, isn’t it? Frances is properly horrible, but I have a soft spot for nasty characters. I do firmly believe she’s a sociopath as she really doesn’t seem to take responsibility for anything and the way she abandoned her husband’s body is shocking yet she doesn’t seem to see that. I didn’t love this one as much as The Sisters Brothers, but Frances is such a character – you really do have to keep reading to see what she’ll do or say next, as you say. I wasn’t a huge fan of The Sisters Brothers (I think it was the violence that put me off) but I do like deWitt’s style… he does kooky and bonkers so well! I’m SO looking forward to reading this. I loved The Sisters Brothers. As I have just mentioned to Annabel (above) I wasn’t a massive fan of The Sisters Brothers — I preferred Undermajordomo Minor — but it’s certainly cut from the same cloth, by which I mean it’s audacious and stylish and just a little bit bonkers! I think I would enjoy spending time in her company, too! It sounds utterly charming.